The mighty griffin let out a shriek when it spotted its destination from the air. It straightened out its wings and went into a wide spiral glide as it gradually lowered its altitude. It landed as gracefully as a beast of its size and weight could, right in the middle of Castle Arin’s courtyard. The fortress itself was not all that different from the ones seen on the western continent aside from a few quirks of traditional raptor architecture. Mostly the way the tall stone walls and turrets all had slanted tiled roofs and were covered in spikes and sticky moss to deter monsters from climbing up them. The inner walls and buildings, on the other hand, had much smoother surfaces and were much more fascinating. The keep itself, for instance, was covered in decorative carvings and painted murals, making it appear far more extravagant than any human, elf or dwarven castle. It would appear that color as a whole had some sort of significance in raptor culture, as evidenced by how all of the lizard-folk roaming about the place had war paint on their faces. Some of the paints used had minor alchemical properties, though their main function was to designate the individual’s role and rank in a very obvious way. The wolfkin kept educating the catgirl on various cultural aspects of the Eight Tribes as they and the other smoothskins made their way across the courtyard. Unlike the port town, however, it was now the locals’ turn to stare at the foreigners. They really couldn’t help it considering the group of people that griffin just dropped off. 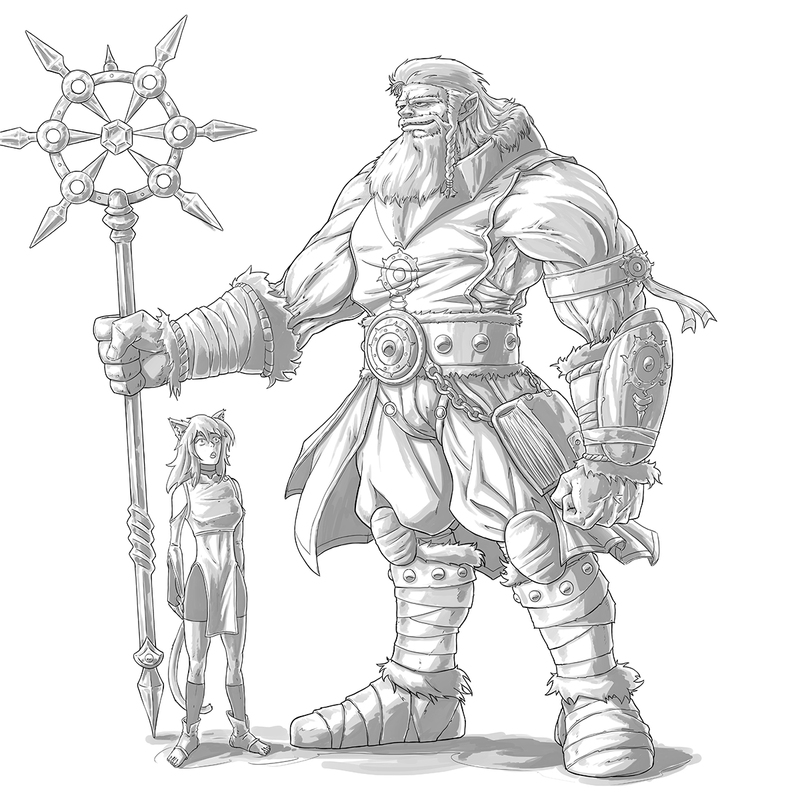 Sure, they had grown accustomed to the sight of smoothskins, but anyone would be taken aback if they saw a muscular giant, a masked nosferata, a mithril golem, a heavily armed dwarf, and a trio of beastkin walking together. In fact, the passing menagerie of people made even the humans on site gawk at them. There were quite a few of them too, most if not all of whom were part of the Imperial Inquisition. Their banners were draped over a few of the buildings around the courtyard and were also hanging from a few of the walls. There must have been a few thousand of them at least, showing that the Inquisition did indeed arrive on Velos in force. There even appeared to be a hastily erected griffin aerie built on the roof of the keep, one big enough to house a half dozen of the flying beasts. The Imperial architects responsible for that particular structure were currently yelling orders at a legion of laborers as they did their best to fix up the old walls and prepare them for the impending orc assault. Keira and the others were guided away from the various ongoing preparations and into Castle Arin’s central keep. The building itself seemed more like a massive villa or mansion than a military installation, which became even more apparent upon seeing the interior. The grand halls, wide corridors, numerous windows and tall ceilings looked impressive and gave it a comfortable feel, but amounted to a lot of wasted space and structural weak points. It was not the sort of place that would hold out for long should the outer wall fall. On the upside it allowed even someone of Orrin’s considerable stature to walk around unhindered unless he wanted to go down the cramped side passages and tight stairways usually reserved for servants. Once further inside, the Inquisition guide asked that Fizzy, Hilda and Kuro wait in the banquet hall. The golem was not as enticed by the promise of free food and drink as the dwarven Berserker and the towering wolfkin, but she accompanied them all the same. The four Heroes, on the other hand, were led to the conference room where the impromptu summit was going to take place. It had tall windows letting in plenty of light, a series of maps pinned to one of the walls, and a total of three people seated around the huge oval-shaped table in the middle. Keira, Nao and Kaede took a chair each, while Orrin sat cross legged on the ground, making the wooden floorboards creak ominously under his weight. The man looked more or less the same as he did when Keira first met him. He was wearing a set of bulky full plate adamantite armor with a golden trim that bore a number of religious symbols related to his faith. 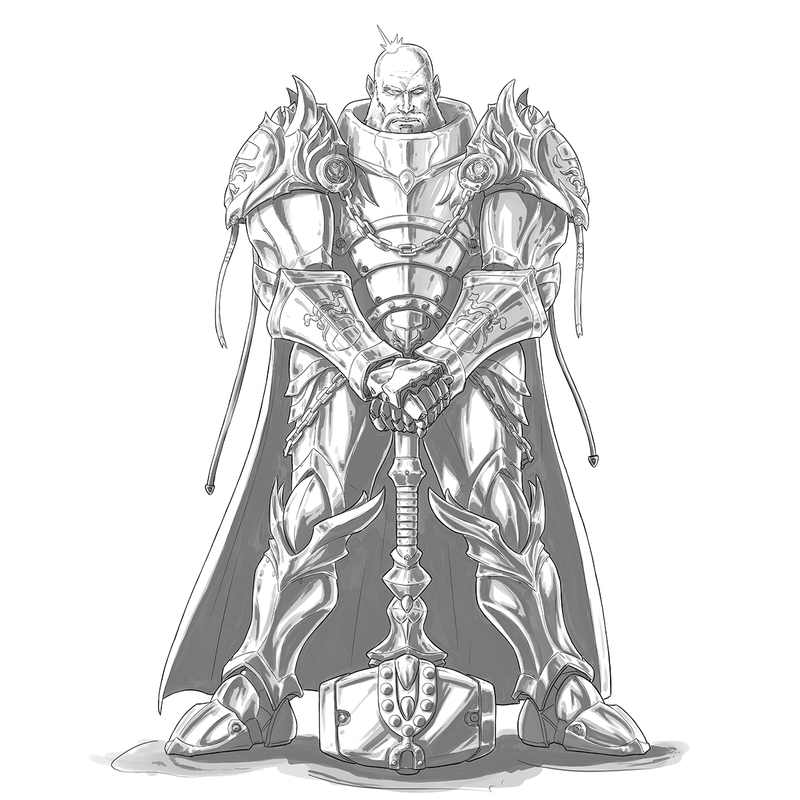 Of particular note were the hammer-shaped insignias on his gauntlets, shoulders and belt. A black cape with the Inquisition’s eye-shaped symbol stamped on the back fluttered behind him, and several ribbons with Imperial heraldry and religious texts were bolted onto his gear. On the whole it was hard to say whether the suit of armor was meant for ceremony or battle, but given the man’s occupation it was safe to assume it could be used for both. Sigmund was currently not wearing his helmet, making his head the only part of him that was actually visible. Boxxy had to admit, it was rather fond of the man’s face, as his scalp was so perfectly bald it was practically shiny. One could hardly even see the cross-shaped scar on his skull with all the light bouncing off of it. The ever-serious expression he had on his face was another story entirely, though the full beard and mustache he had served only to accentuate his smooth cranium. Having finished his self introduction, Sigmund gestured towards the raptor immediately to his right, inviting them to follow his example. The individual in question was also wearing a full plate of armor, though it was vastly different from Sigmund’s. Unlike the black adamantite the human was using, this one was forged out of radiant white mithril. It also lacked any sort of religious iconography. It did bear a silver-colored pattern and a small shoulder-cape, but those denoted heritage rather than faith. 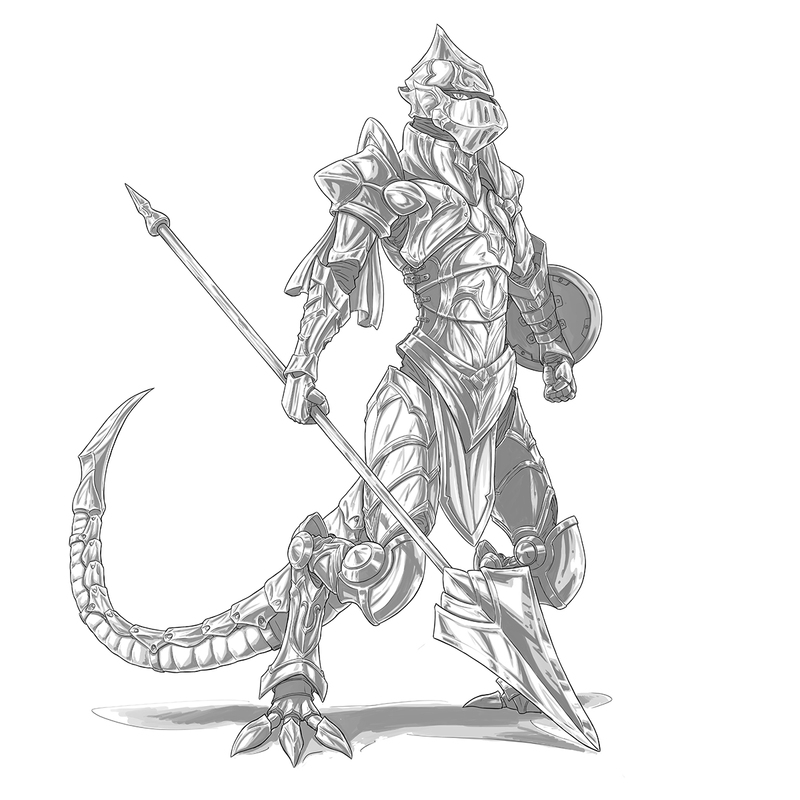 The armor itself was made to fit raptor physiology, which gave it a rather exotic feel from the outsiders’ perspective. Especially the way it covered the upper half of the Hero of the Sword’s reptilian tail, which ended in a dagger-like blade at the tip. 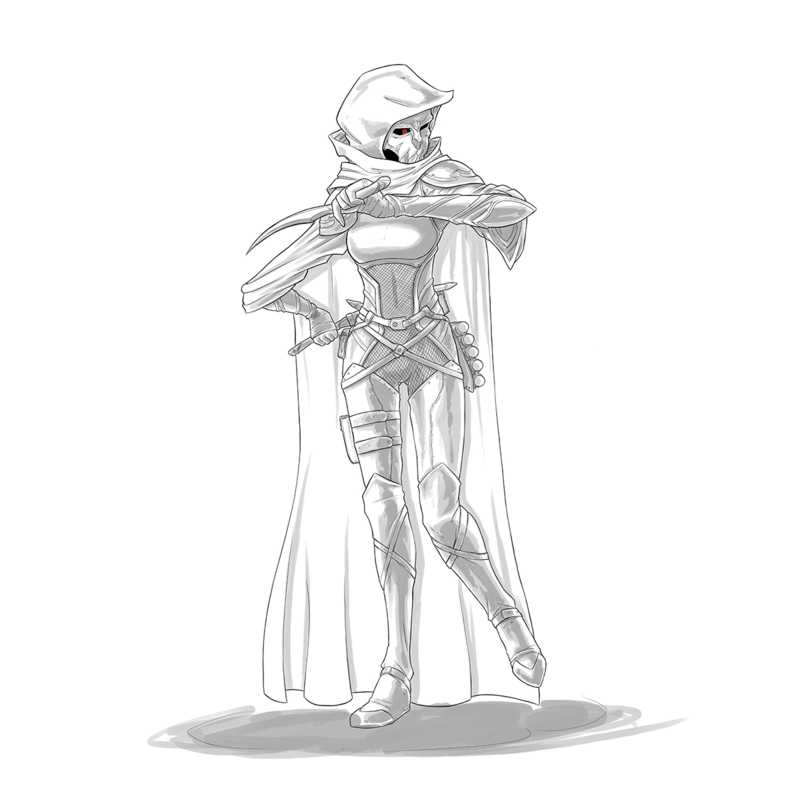 However, the she-lizard seemed unwilling to take off her ridged helmet, which also slightly distorted her voice. It would be practically impossible to tell she was even female if not for subtle clues like the shortness of the helmet’s beak and the smoothness of the scaly tail’s underside. It was a bit odd she refused to show her face and head, but that could also be attributed to her birth. 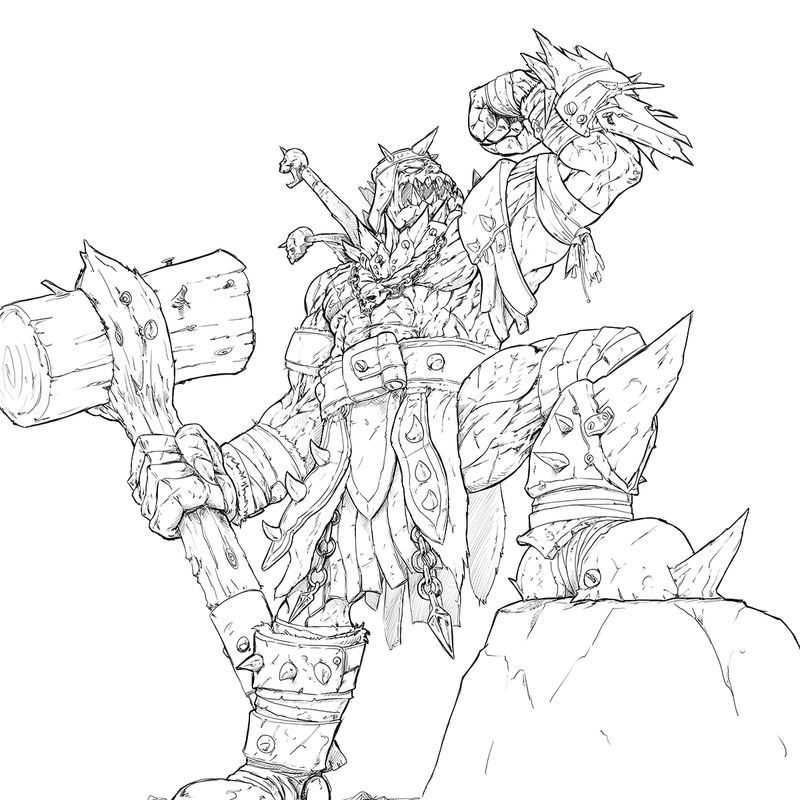 The Broadfang Tribe were the most brutal and warlike of the Eight Tribes, with a deep rooted ‘survival of the fittest’ mentality. Any soldier hailing from that tribe was taught to be ready for combat at a moment’s notice, and Hesk’s position as Broadfang Paragon meant she was the greatest among them. Up next was the other raptor in the room, this one most definitely a male. This Hero of Rain was an individual Keira had already heard plenty about from Hilda, who had apparently worked with him in the past. He was a noticeably older lizardman, as evidenced by the worn and dried out appearance of his deep green scales. He was wrapped in loose-fitting and sturdy clothes with a thick, hooded blue cloak on his shoulders. His face was decorated with lines of bright blue war paint, matching the color of his garment and signifying his magical abilities. He had a bulging pouch tied to his hip, a pale yellow crystal ball resting in his right palm and various stick-like talismans and charms dangling off of his wrists and waist on strings. Those trinkets were mostly unremarkable mediums for his Shaman arts, but the orb he was holding was of a particular interest. Unless Boxxy missed its guess, it was a magus sphere, a rare magic amplification item that filled much the same function as a staff. One would expect a Shaman to have a totem instead, but that wasn’t Gux’s primary occupation. In reality the man was a Level 100 Psionic, meaning he had Ranked Up into a razorscale raptor. This gave him a number of enviable advantages, such as the ability to regrow lost limbs with time and the use of the movement-enhancing Slipstream Skill. Unlike ascended humans or stonekin dwarves, this higher species was easily distinguishable from its base variant by the spiky fin-like growths that poked out of his skull and ran down the length of his tail. Given his Ranker status, he was without a doubt the oldest and seemingly most powerful of the Heroes, but at the same time was arguably also the most unreliable. As evidenced by his odd self-introduction, the razorscale raptor was not entirely sane. His unfocused milky-white eyes were also completely blind since birth. His Psionic abilities made up for his lack of sight somewhat, turning what would normally be a substantial handicap into a manageable problem. He was a troubled individual to be sure, but also a free spirit that held a deep love for travel, adventure, and the splendor of nature - all virtues that Zephyra absolutely adored. Not wishing to address the elephant in the room just yet, the group continued going around the table, though it took the next in line a few moments of silence to realize it was their turn. True to his word, the wolfkin had shown up completely unarmed. One could argue that a Caster needed only their wits and tongue to wreak havoc upon their enemy, but they would still normally have a staff or something to amplify their output. Such a thing was not present on Nao’s person. 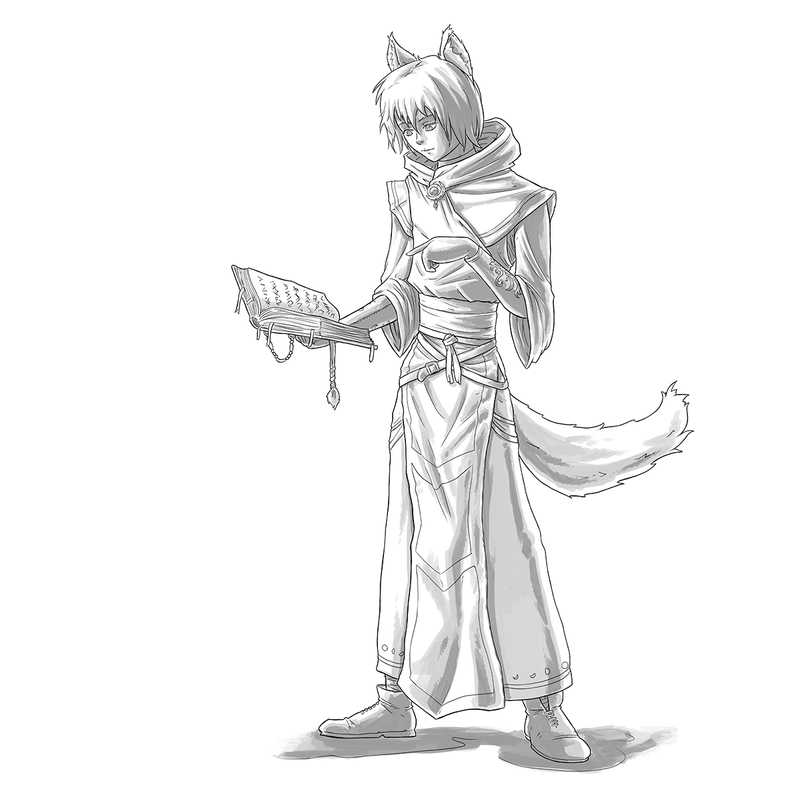 He still had a fancy-looking robe that was most likely a high-class magic item, but the only thing it would protect him from was the humid air and hot temperatures. Admittedly Hesk’s armor and Gux’s attire both had similar functions in them to help regulate their stamina, but neither of those armor sets were anywhere near as comfortable as Nao’s. Unlike her wolf-eared counterpart, the catgirl had shown up in full combat gear. 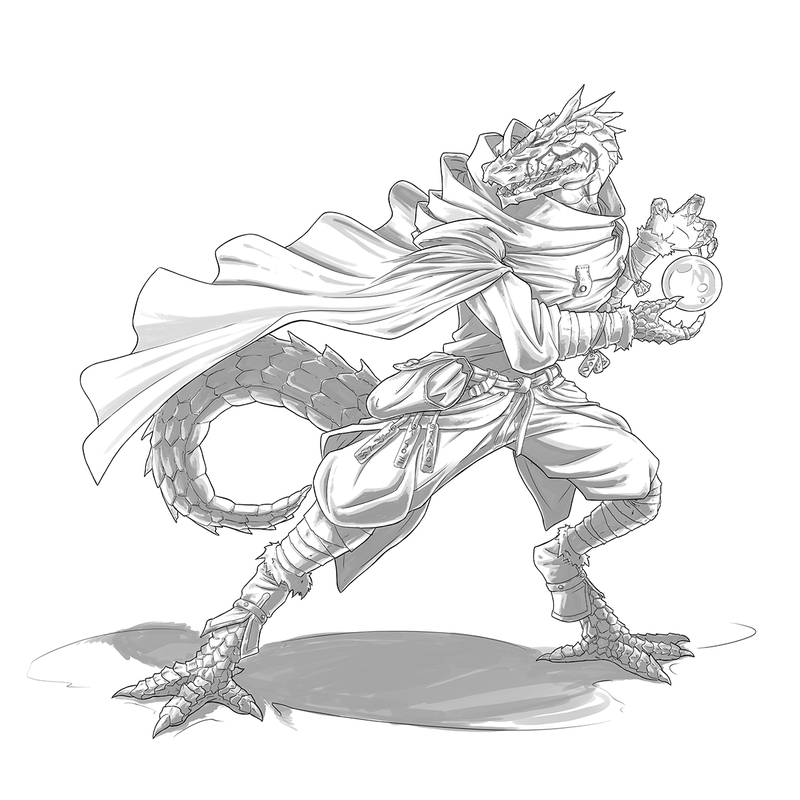 Its innermost layer consisted of a form-fitting tunic and trousers stitched together from wyvern leather. The high-grade blue and brown equipment was excellent at making slashing attacks slide right off it while also enhancing speed and mobility to facilitate evasion and silent movement. She also had a breastplate shielding her upper torso, a slim shoulder pad on her left side, and a custom made helmet with holes for her feline ears on her head. Those three pieces of metal armor were forged from a mithril-obsidian alloy, making them naturally dark, light, and durable enough to protect a beastkin’s vital areas. She also had a hole in her trousers to let her tail move freely and assist in maintaining her balance. In terms of weaponry, Keira only seemed to have her trusty mithril rapier sheathed at her left hip. In actuality she was packing an entire arsenal of blades, bows, arrows and explosives, all of which were packed into the Artifact-grade belt on her waist, known as Aetherial Repository #3. Potions, rations, campfire kits, sleeping bags and other essential supplies and tools were also tucked in there, but the vast majority of its contents were implements of death and/or destruction. “Be serious for once in your life,” Keira scolded her. “… Is something the matter, Hesk of clan Susk?” Orrin asked in a calm manner. “I’m with the scary lizard lady on this one,” Keira chimed in. “I have a name, furball,” Hesk hissed while slamming her tail against the floor in protest. “Yeah, sure, but are you or are you not a scary lizard lady?” the catgirl insisted. That title was something Keira’s students had came up with on their own about a year ago, but their collective exploits had already given it a certain amount of weight. One of said students, for instance, reportedly wiped out a gang of nearly three hundred bandits all by himself. It took him several weeks to do so, but the only thing the brutes saw of him during that time were his arrows and traps. A dwarven Rogue, on the other hand, had infiltrated a criminal cartel within the Horkensaft Kingdom and gathered enough information to help the local authorities completely dismantle their operation. Then there was the female elf Ranger who tracked down and rescued the kidnapped heir to an Imperial noble house, leading to the two of them falling in love and marrying within a few months. A heavy silence gripped the room. The female raptor’s dark and serious tone made it abundantly clear to the newly arrived Heroes exactly how grim the situation actually was. Except for Kaede, who seemed to be as nonchalant about the whole affair as ever if her childish grumbling was any indication. The mithril golem in question carried the immutable title of High Templar of the First Underworld Crusade. She was perhaps the only being on this continent to have firsthand experience with a divine call to arms, so it was only to be expected that her words would carry extra weight, even if they were borrowed. The nonchalant attitude of the Hero of Death made Hesk slam her tail against the floor once again, almost like a judge demanding order in the court. It was unclear if that was her intention, but the effect was pretty much the same. The Hero of Rain ignored the human’s complaint and flexed his telekinetic muscles. The magus sphere in his hand floated towards the center of the massive table everyone was sitting around. A series of blue light beams shot out of it, bending and twisting around each other as they drew a three dimensional figure in the air. A few seconds later, the four meter tall illusory image had solidified into the shape of an orc. The specimen on display was like a savage mountain of muscle. A wide chest, massive shoulders, and exceptionally thick arms and hands, all of which were covered in countless scars. His physique gave him a very fiend-like appearance, except his face was nowhere near as handsome as a demon’s. The floppy pointed ears normally found on orcs were missing entirely, his nose was short, wide and mangled, but his most prominent facial feature was the mouth. A massive lower jaw, no presence of lips whatsoever, allowing everyone to see his two rows of giant, pointy fangs that were more akin to spikes than teeth. Speaking of spikes, the orc was positively covered in them. His equipment consisted of a loincloth, a pair of boots, a set of vambraces, a shoulder pad and a cap. It wouldn’t function very well as armor seeing as how it left his chest, back and most of his limbs completely exposed. Not that this primitive-looking gear could stop anything resembling a serious attack. It looked to be cobbled together from vines, fur, bone, and metal shards, all of which would crumble the instant it met an adventurer’s weapon. However, it was impossible to deny that the skulls, spikes and chains combined with that monstrous physique gave the orc an imposing and intimidating appearance. The Skill in question was called Wandering Mind, and was something Boxxy had found out about through Hilda. It was a clairvoyance ability that separated the user’s consciousness from their body, giving them what was essentially a remote controlled MLG. Its perception range was limited to a radius of about twelve meters and it could not ‘see’ through solid matter, but the Wandering Mind itself could fly and phase through inanimate objects at will. The distance it could travel was only limited by the user’s MP reserves and it wasn’t all that useful in combat, but it was still an excellent scouting tool. The fact that it was practically undetectable also meant the user was free to spy on others with little to no repercussion, though Gux did his best not to abuse it. Well, he did technically peek on some bathing beauties once or twice, but that was mostly to see if he could. “What you will need to note here is the creature’s height,” Teresa’s chosen continued. “Wait, you mean this projection is to scale?” Nao asked with wide eyes. “That is so, Child of the Moon,” Gux confirmed. The female raptor stood from her seat and grabbed the pole weapon that had been resting against a nearby wall. Its wide triangular head made the weapon look like an oversized arrow, but the way she handled it made it abundantly clear it was a spear. One that she pointed at the translucent orc’s chest after hopping onto the wooden table, her armored toes scraping against the wood. Hesk then jabbed the scar she was talking about, making the spear’s wide blade pierce the lump of blue light. It was a perfect fit if one were to ignore the wound’s larger size. “How can you be so sure it was not made by a similar blade?” Keira asked. This was precisely what Boxxy wanted to hear. Though the spear’s dull grade blade was not exactly shiny, its status as a unique high-grade weapon made it worthy of catching the shapeshifter’s interest as a collector. Though it would seem the not-a-catgirl was not the only one who was curious about it. Magic items had a way of manifesting unique properties if they were used frequently for long periods of time. This ‘Item Rank Up’ was by far the most common way through which Artifact and Phantasmal grade equipment came into existence, and decades of killing orcs seemed like the perfect formula to make such a metamorphosis happen. In fact, the need to suppress hordes of the bloodthirsty creatures with wide-area mental attacks, or ‘stemming the green tide’ as the locals called it, was what led to the birth of the Psionic Job. “Unless he was stabbed before the spear obtained its unique property,” Keira pointed out. Hesk stabbed at the illusory monster once more with the tip of her spear. She then climbed down from the table and took her seat, giving the newcomers a moment to process this information. “Might I ask how you are so certain of that?” Orrin inquired. There was a moment of awkward silence as Hesk genuinely had no idea how to respond to that. Neither did the other Heroes. Gux, for instance, was sitting patiently and quietly as if waiting for a storm to blow over. Keira’s ‘educational’ arm was already mid swing while her student giggled quietly behind her mask. Orrin had a look of bemused confusion while Nao hid his face in his palms. As for Sigmund, he crossed his arms, leaned back in his seat and let out a long sigh. He still wasn’t sure whether this gathering would serve any actual purpose or if they were chasing something that wasn’t there, but Kaede’s question made one thing abundantly clear. This was going to be a looong meeting. All artwork in this chapter is courtesy of dmaxcustom. Damn, the art is good specially like Sigmund and the Raptors. That sounds like a good name for a band. Are you ready for April 18th, live at the continent of Velos, it's Teresa's Chosen, rocking us with hammering songs of praise! Accompanied by orc-killing guitar solos of the Hero of the Sword, and the wild and free drum solos of the blind Hero of Zephyra! Tickets start at 499 gold! Aye, Sounds like a good show. I agree that Kaede is the one asking the hard-hitting questions. She is a disgutingly ugly Nosferatu. No matter how awesome her personality is, or how cute her outfit is, nobody would want to marry her. Beauty is in the eye of the beholder. And I don't mean the floaty kind. Yeah, that was how I read it too. Damn I could've been first comment if I checked the comment section before reading!!! So many pictures, thanks for the chapter! Looong meeting indeed. Very fun chapter. i can already hear thankful prayers going to many deities that nosferatu age quick. Just wait for her to get longevity from stat gains. Even Hilda has a child like enthusiasm still. stats don't increase you life span. Ranking does.